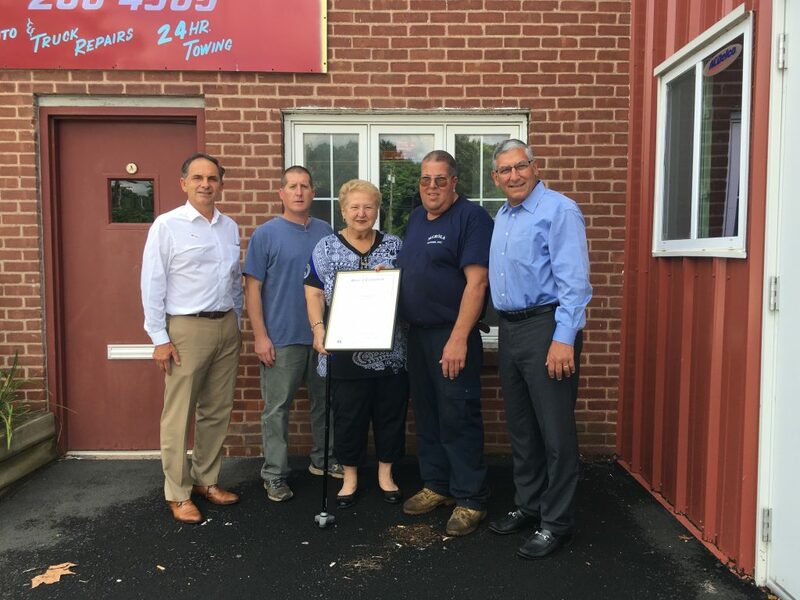 State Representative Dave Yaccarino and State Senator Len Fasano presented a General Assembly Citation to Mary Jane Mulligan on Tuesday, August 14th, 2018 in recognition of her being awarded a Lifetime Achievement Award from the North Haven Rotary Club. State Representative Dave Yaccarino, Rich Mulligan, Mary Jane Mulligan, Shawn Mulligan and State Senator Len Fasano outside of Merola Motors in North Haven on Tuesday, August 14, 2018 after Mary Jane Mulligan was presented a General Assembly Citation for receiving a Lifetime Achievement Award from the North Haven Rotary Club. “Congratulations to Mary Jane for her many years of service and dedication to our community. It is great to see her passion for service recognized with a lifetime achievement award,” Sen. Fasano added. Mary Jane is the owner of Merola Motors in North Haven, a full-service preventive maintenance and auto repairs center specializing in General Services, Car & Truck Care, Inspections and Emissions, Undercar Services, Tires, Engine & Transmission, Engine Maintenance, Transmission Services, Heating and Cooling Services, Electrical Services, Electronic Services, Miscellaneous Services and Towing since 1947. Anyone with questions pertaining to any state or local issue can contact Representative Yaccarino at 860-240-8700 or Dave.Yaccarino@housegop.ct.gov and Senator Fasano at 860-240-8800 or Len.Fasano@cga.ct.gov.